Deep clouds, polar storms, lopsided gravity, and a uniformly rotating interior demonstrate that the gas giant plays by different rules than Earth. New results from NASA’s Juno spacecraft, currently in orbit around Jupiter, revealed that the largest planet in our solar system behaves quite differently from Earth within and below its upper atmosphere. The data from its first 10 science passes above the planet revealed four findings about Jupiter’s interior structure, its atmosphere, and its gravity field that surprised planetary scientists. Each of the four Jovian discoveries, which span the planet’s gravity, atmosphere, and weather, was published in a series of Nature papers earlier this month. Here’s an overview of what the Juno team found. One look at a visible-light image of Jupiter shows that the planet wears its stripes well: Belts and zones of alternating light and dark clouds encircle the planet at middle to high latitudes, occasionally interrupted by swirls of mixing gas and stormy splotches. 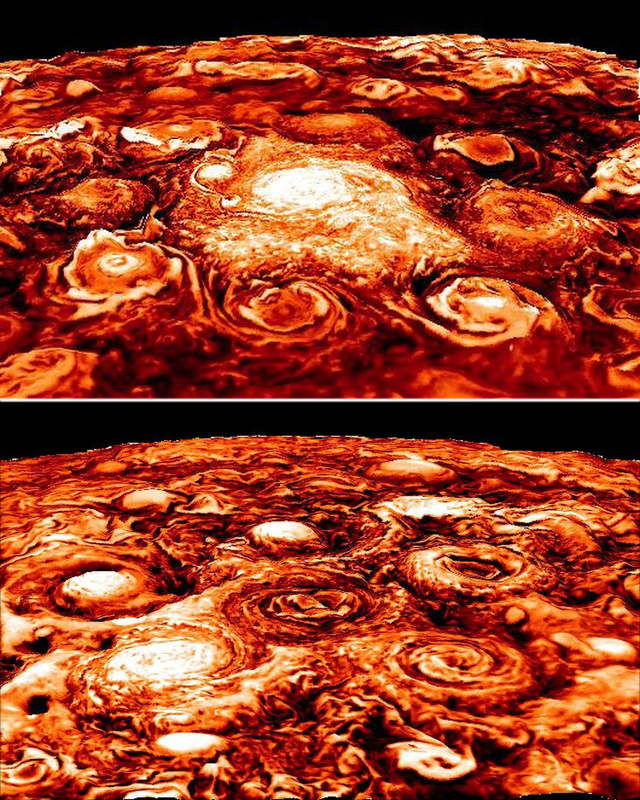 Juno revealed that the planet’s atmospheric patterns change at both poles, especially when viewed in infrared light. In the north, a central polar cyclone is surrounded by eight distinctly separate spiraling storms. Jupiter also has a southern polar storm, encompassed by five separate storms in a pentagonal shape. Jupiter’s polar and circumpolar storms are 4,000–7,000 kilometers in diameter and are so tightly packed in their clusters that their hurricane-like spiral arms touch each other. That’s where another surprise comes in: Adjacent storms touch without merging, a previously unseen phenomenon. The nine northern and, separately, the six southern storms remained separated throughout Juno’s observations. On Earth, hurricanes that touch often merge in a matter of days or weeks; Jupiter’s remained separate for at least 7 months. Adriani and his coauthors hope that further Juno data will help solve the puzzle of the nonmerging cyclones. Jupiter doesn’t contain surprises only at its surface. It also has hidden depths that Juno is uncovering bit by bit. Recent discoveries stem from the first analyses of these gravity data and their startling conclusion: Jupiter’s gravity is asymmetric. One of the primary goals of the Juno mission is to take precise and detailed measurements of Jupiter’s gravity field using its Gravity Science instrument to reveal structure and movement deep within the planet. The remaining recent discoveries all stem from the first analyses of these gravity data and their startling conclusion: Jupiter’s gravity is asymmetric. Why should that be so surprising? Scientists have long thought that Jupiter’s interior layers consist of a small, solid core in the center; a sluggish, thick atmosphere above; and, on top, a thin, turbulent upper atmospheric layer containing all the weather visible via satellites. That structure, in the absence of any large-scale turbulence, would have produced a roughly spherical, symmetric gravity field in all directions. But, instead, Juno measured a gravity field shaped differently in the northern hemisphere than in the southern hemisphere, “similar to the asymmetry observed in its zones and belts,” said Luciano Iess, professor of mechanical and aerospace engineering at Sapienza Università di Roma in Italy and lead author on the Nature paper on Jupiter’s gravity field. That asymmetry suggests that the thick lower layers might contain deep atmospheric flows that transport a large amount of mass around the inside of the planet at different rates in the north than in the south, breaking the expected symmetry. The upper atmosphere stripes reach nearly 3,000 kilometers below the cloud tops and contain about 1% of Jupiter’s total mass. Another surprising discovery from the Juno gravity data is that the planet’s stripes extend far deeper into the atmosphere than expected. They reach nearly 3,000 kilometers below the cloud tops and contain about 1% of Jupiter’s total mass, the researchers found. Earth’s atmosphere, by comparison, contains less than one millionth of our planet’s total mass. The planet’s alternating bands and zones move in different directions, and the speed and direction of their movement are related to atmospheric jet streams that reach very deep beneath the top of the atmosphere, the team found. Using Juno’s high-resolution and detailed gravity measurements to peer beneath the planet’s stripes was “like going from a 2-D picture to a 3-D version in high definition,” according to lead author Yohai Kaspi, Juno coinvestigator from the Weizmann Institute of Science in Rehovot, Israel. Figuring out how deep the east–west jet streams go was a primary goal for the Juno mission, and the team wasn’t expecting that distinctly rotating sections of the atmosphere could extend so deep without dissipating, mixing together, or eventually dragging each other to a uniform speed. And beneath those rotating stripes? The team found that the rest of the planet rotates as if it’s one solid object from pole to pole, largely unaffected by the alternating jet streams above. It surprised the team to learn that the planet’s nonuniform rotation—known as differential rotation—drops off so sharply just beneath the upper weather layer. The alternating movements of the top-level belts and zone are separate from the internal, solid-body rotation, as shown in this video. Differential rotation typically occurs when the material that makes up a rotating object is not held together by rigid bonds. For example, material at the poles and the equators of rocky solid planets like Earth completes 360° rotations at the same speed. But the Sun, other stars, and other giant planets, which are all made up of gas, rotate at different speeds at their poles than at their equators. According to the new gravity measurements from Juno, Jupiter’s differentially rotating weather layer extends down to about 3,500 kilometers below the top of the atmosphere, consistent with measurements of the alternating jet streams. Below that, the team reported, electric and magnetic forces cause enough atmospheric drag to force the rest of the planet to rotate nearly as one. “This is really an amazing result,” said Tristan Guillot, “and future measurements by Juno will help us understand how the transition works between the weather layer and the rigid body below.” Guillot is the lead author on the Nature paper discussing Jupiter’s internal rotation and a Juno coinvestigator from the Université Côte d’Azur in Nice, France. Juno arrived at Jupiter on 4 July 2016 and completes one polar orbit every 53 days. The spacecraft finished its tenth pass above the planet on 7 February, with only two more orbits remaining before the end of its budgeted mission in July of this year. Some of the data from the beginning of the satellite’s eleventh orbit are now available to the public. Citation: Cartier, K. M. S. (2018), New Juno data reveal four key secrets of Jupiter, Eos, 99, https://doi.org/10.1029/2018EO095731. Published on 28 March 2018.